On Saturday 21st July the first game of the British Championship, between Andrew Simons and Sam Aitken, took place. After more than 6 hours of play, Andrew Simons won by 2.5 points after Sam failed to successfully invade a large corner of Andrew's. The title match is best-of-three. Matthew Macfadyen gave a commentary on KGS. Both the raw game record, and the version with Matthew's commentary, are available here. Last updated Sat Oct 13 2018. If you have any comments, please email the webmaster on web-master AT britgo DOT org. During the 5th Annual World Collegiate Weichi Championship in Cambridge BGA reporter Andrew Simons had a chat with some of the players. AS: Hi. What's your name and where do you come from? YW: Hi. My name is Yuzhang Wu and I'm from China originally but studying at Manchester University in England. AS: What are you studying? YW: Mechanical and Nuclear Engineering. AS: Did you learn Go here or in China? YW: I learnt in China, but now Eric Zhang in Manchester is my teacher, maybe you know him? AS: Ah, Yangran, yes I know him well, we often meet at the London Open tournament. So what group are you playing in and how was your first game? 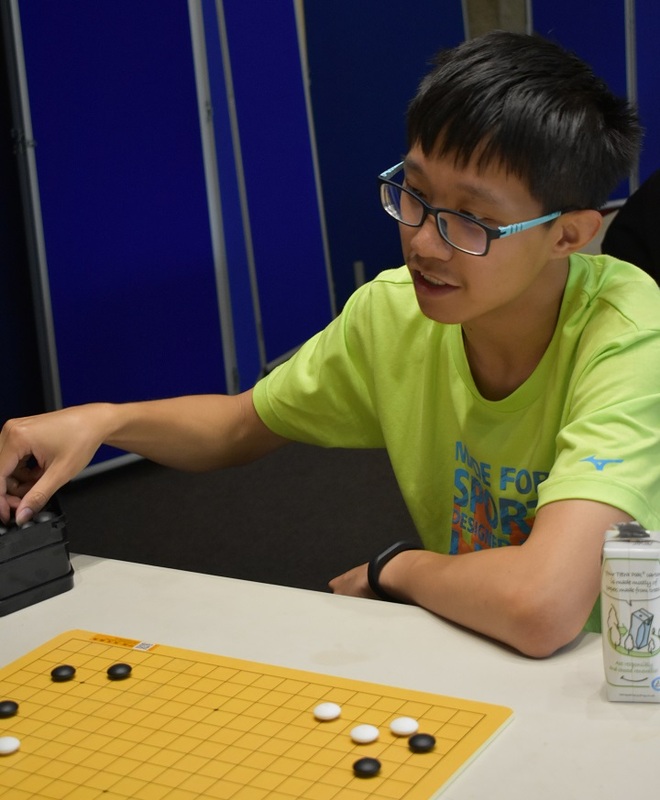 The fifth Annual World Collegiate Weiqi Championship (AWCC) was held in Cambridge this year and organised by the International University Weichi Federation (IUWF). Naturally it was supported by the BGA and sets were provided by the Ing Foundation in Shanghai. Many of the organising team were students at British Universities including Daniel Hu, Junan Jiang, Weichin Dai and Joanne Leung. 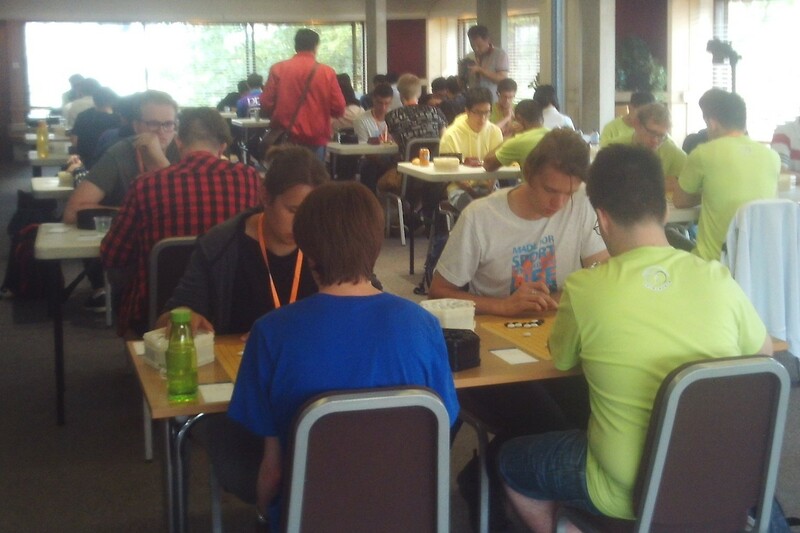 The tournament had 102 players (a view of one of the two playing rooms is shown here). It was held over two days and six rounds, apart from the A group that also had semi-finals and final (shown below) on the third day, the Friday. This was broadcast on a Chinese Go server, like the pro games, and analysed by professionals (shown below middle with Daniel Hu translating) for the other student players. 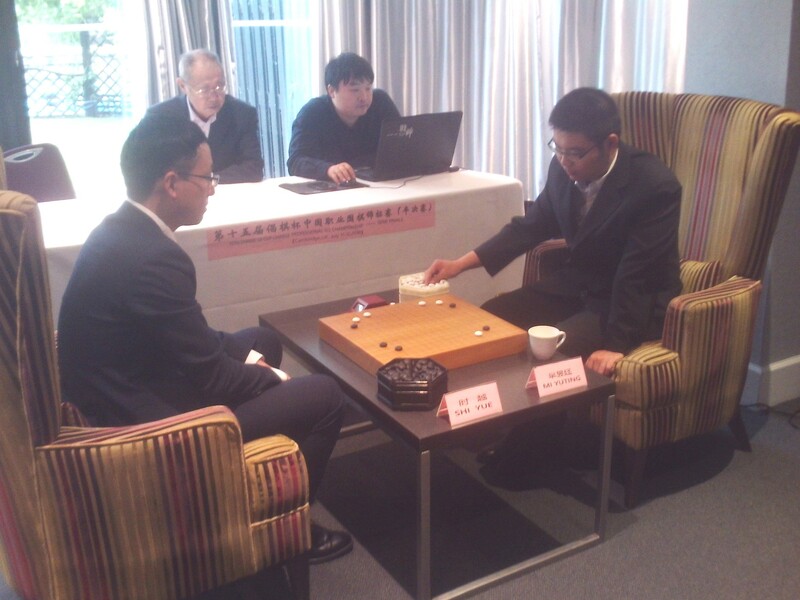 Alongside the Championship are the semifinals of the Chang Qi Cup, a Professional Tournament normally held in China. The photo shows the start of the second game between Shi Yue and Mi Yuting; Mi Yuting defeated Shi Yue 2-0 in the best of-three match. The 26th Welsh Open proved to be a hot one - both in the air temperature approaching 30C and the fierce competition for overall winner. The regular organisers & tournament directors Helen and Martin Harvey apologised the previous year for ineffective sun-dancing leading to rain. This year the TDs sought forgiveness - for over-zealous sun-dancing, however. The resultant queuing at the bar at least kept the hotel-owner happy, and meant we could avoid the queues if players wanted hot drinks or - in many cases - cold water. Held in its constant, scenic coastal town of Barmouth since 1993, the event again passed off smoothly and enjoyably. A slight increase meant that 33 played in at least one of the six rounds, including three shodans and down to a 17-kyu. Participants once more travelled from across the UK – from Dundee, Cambridge, London and yes, two from Wales! Numbers and conversation at the evening meals were enhanced by non-playing partners. Last updated Mon Jul 09 2018. If you have any comments, please email the webmaster on web-master AT britgo DOT org. Twenty-four players contested the Scottish Open 2018 over two days at the Offices of Skyscanner in the centre of Edinburgh. Thanks to Skyscanner, as well as hosting the event, the participants were fuelled throughout the contest with drinks and copious pizza. Also on the Saturday evening the movie "The Surrounding Game" was shown. Local player Boris Mitrovic (2d) retained the title by winning all his games. On four wins out of six were Neil McLean (1k), Toby Manning (1d), Alistair Wall (1d), Rob Payne (6k) and Roger Daniel (7k). James Richards (2k Edinburgh) won the 9×9 small board contest. Last updated Mon Jul 23 2018. If you have any comments, please email the webmaster on web-master AT britgo DOT org.